I've been eying this book for weeks and two days ago I finally found time to pick it up and read it. I didn't hear much about it before I started to read it but i definitely feel in love with the gorgeous cover when I first saw it. Unfortunately what's inside isn't as gorgeous as the cover. On the back of the book I found a few comments from reviews of this book where one of them mentions Twilight, which made me think that maybe this will be just another Vampire story. It ain't, though I can see why one would compare the two. There are a few similar features, like the Vincent's 'family' constellation. But, let's start with the things I did enjoy about this book. I love that it plays in Paris, because I didn't read much yet that played outside of the US or Germany, so Paris was a very welcome diversion. Throughout the book one can really get a good look at the city and its charm, which caused me to really want to go there myself and visit all these wonderful places which the book described. Furthermore, I liked the whole idea and history behind the "Revenants". It was something new and different from the typical creatures, like Vampires or Werewolves. I like how their history was nicely woven into out actual history, mentioning World War One and Two, while mostly focusing on the events that took place in France, which was refreshing. The characters were fairly likable and I did really enjoy the sister dynamics between Kate and Georgia. I also liked their grandparents who, as for being grandparents, planed a very subtle and open-minded role in the story. They gave Kate, who is only 16 soon turning 17, a lot of freedom, more then I think normal grandparents would give their granddaughter. But hey, that's fine; it's YA and nothing unusual for that genre. Kate is a likable character who suffered a great loss, being the death of both her parents. Throughout Die for Me she struggles to deal with it but as the story progresses she manages to find a possibility to come to terms with it, as far as one can with something like that. Fortunately, she wasn't one of those typical heroines who is naive and passive, she was strong and able to make her own decisions no matter what. Vincent was the hotty of the story. The mysterious boy with the dangerous aura, which pulled Kate to him like magic, despite her better judgment. I liked him; he was a good main male character with a unpronounceable French last name. And now to the things that I liked a little less. The plot was sometimes a little too predictable for me, which took the fun out of it at certain parts. Also the evil villains was quite easy to spot, especially because of his name which was like a glowing sign that just made noticing it inevitable. I would have wished that the author would have giving him a less obvious name, which would have made the revealing a little more exciting. Also spotting Kate's sisters role in the whole thing was easy to guess, but that was all right. Besides that I had a good time reading Die for Me and despite the rating I give it, I might pick up the sequel in the future and give it a chance. Maybe it'll get better? All in all, if you are interested in a supernatural read, which for once isn't about Vampires, Angels or Werewolves, Die for Me might be something for you. 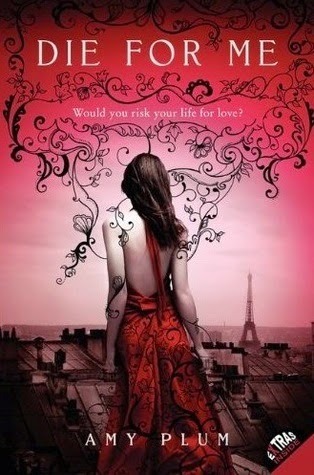 I give Die for Me by Amy Plum 3 out of 5 Stars.